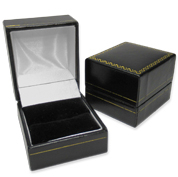 Find the best black leatherette gift boxes and showcase your pieces in style! These high-quality items have a gold trim and are perfect for showcasing rings, earrings, cufflinks, necklaces, chains & more. Get the best deals thanks to our special wholesale discounts & deals!